Graduation season is upon us and we're busy working on some things to celebrate the grads. I've got several going on in my family as well, first of which is my cousin Chelsea, who will earn her BFA in Printmaking next month. Chelsea has loved horses since the day she was born and is a member of the equestrian team at Arcadia. 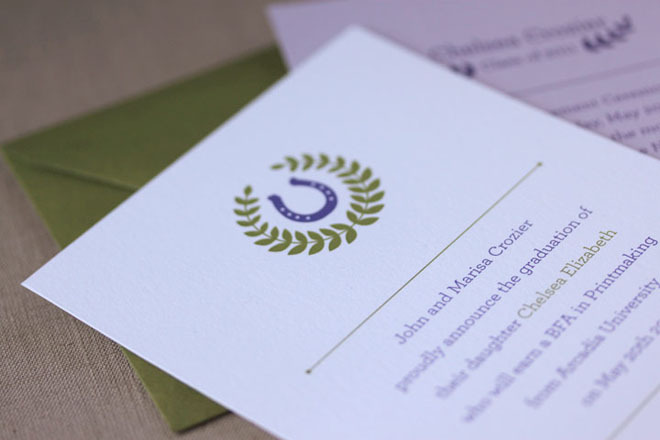 When she asked if I would design her announcements & invitations, I began to develop this idea of a crest that was uniquely hers. The horseshoe doubles as both a symbol of her passion for riding as well as a good luck charm for the next phase of her life. The laurel wreath is traditionally a symbol of victory, appropriate for all the hard work she's put in to earn her degree with honors. 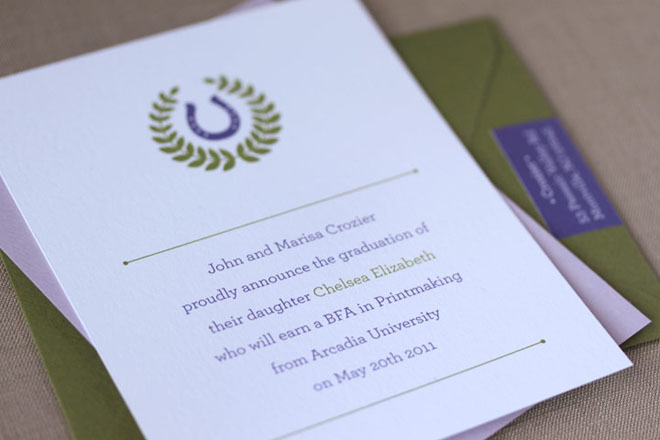 Chelsea's favorite color is sage green, and I paired that with a deep purple and lavendar colored paper for a touch of femininity.